We like to think of our hotel as your home away from home. With friendly staff, comfortable rooms and some of the most affordable rates available, First Canada Inns will make sure you wake up to value every morning. First Canada Inns Kingston is not just a hotel; it’s an experience. 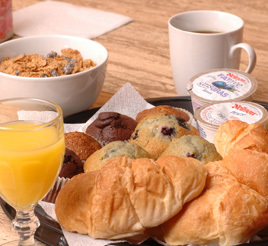 Join us for a delicious deluxe breakfast, and fresh coffee all day long. We keep the pot brewing in our lobby 24/7. Wind down at the end of the day with a dip in our exceptional indoor swimming pool, have a drink and a game of pool in our Limestone Lounge, or when the weather permits, relax on our outdoor patio. Pets are welcome: We allow dogs – under 50 lbs, no cats. There is a $10 plus tax per night fee. Dogs must be crated when left alone in the room, guest must leave a cell phone number with the front desk when leaving dog unattended. First Canada Inns Kingston is just a two-minute drive from Highway 401, and closely located to attractions, restaurants, and shopping centres: a seven-minute drive to Kingston’s world-famous waterfront, the K-ROCK Centre, the Grand Theatre, and other attractions; a 15-minute drive to historic Fort Henry; a five-minute walk to Kingston’s premier outlet mall; a 10-minute drive to Queen's University; and a five-minute walk to 14 restaurants including East Sides Mario’s, Starbucks, Boston Pizza, Swiss Chalet, McDonald’s, Tim Horton’s, Harvey’s, Wendy’s, Mr. Sub, Dairy Queen, Pizza Hut, Kentucky Fried Chicken, Denny’s, Arby’s, and A&W.